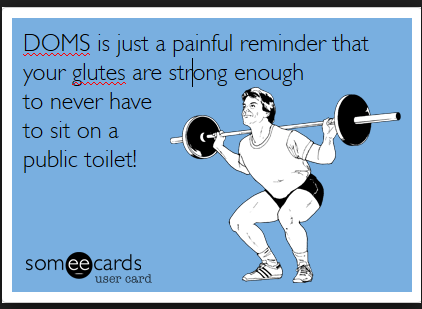 Monday I was aching after the gym, Tuesday I felt fine, this morning (https://fatnessnowfitness.wordpress.com/2014/01/22/old-age-or-doms-tj143/?preview=true&preview_id=3434&preview_nonce=34a8c4d6ca&post_format=standard) I felt that I may have had DOMS. Gradually during the day the ache went – old age and arthritis then says the jury! So off I go all happy to the gym where the treadmill awaits. Just done a minute on treadmill and laces come undone, I stop the machine and then it won’t restart, not keen anyway so rather than wait for an instructor I jump on the rower. Instead of a hiit I think I know I’ll do 5k I have 38 minutes before I have to leave to collect son from work! All I can say is ouch ouch ouch, and yay that feels great – I did it. Was flagging a bit and two guys came along and were racing each other so I joined in got the 5k done in 36 min 10 seconds – was very pleased with that and I could feel the sweat despite the arctic air conditioning. I may suffer more tomorrow but that is apparently good, so Steve tells me! I was given suggestions/instructions from he who must be obeyed about how to handle the new running stuff, he is adapting the C25K to better suit my abilities and time. Well! I sort of did what he said lol :). I went back to the site of the Parkrun where I got ill and I did the 5k (3.17 miles) walk, but this time I ran as well, in fact I ran for 1.2 miles (1.93 km) of the course, but slowed down a lot in the gaps, so the time wasn’t great but was a PB of 55 minutes 36 seconds. I know not a world record or anything but I RAN for over a third of the way and it felt GOOD. I especially liked the bits where I ran really fast, I felt free, alive, natural, connected to the earth somehow, primal I suppose is the word I’m looking for. For once using my body to do what evolution designed it to do (child bearing aside).